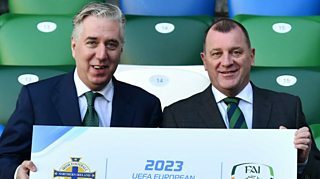 Both the Irish FA and the Football Association of Ireland are confident Brexit will not hinder the joint Irish bid to host the 2023 European Under-21 Finals. Irish FA chief executive Patrick Nelson says last year's finals in Poland generated £20m for the country's economy which included 100,000 bed nights. FAI chief John Delaney says the bid is helping to bring the two associations closer together.